Any weather concerning schedule updates will be announced on the NYSW TopSoccer page! IF YOU ARE REGISTERING FOR THE TOPSoccer Rochester Program, please scroll down to the TOPSoccer Rochester Info page below and click on ths specific registration link there! 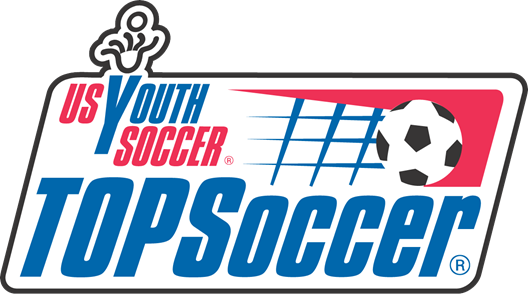 TOPSoccer, The Outreach Program for Soccer, is a New York State West and US Youth Soccer official program. This program is designed for children with disabilities, ages 5 to 21. The program accommodates all disabilities whether mental or physical. This is an exciting program that brings the joy of playing soccer to players who have not traditionally had a place in the youth soccer system. The key to this program is flexibility. TOPSoccer can offer opportunities such as single day clinics, jamborees, weekly training, individual skills programs and even recreational league play. TOPSoccer is fully supported with training materials, assessment tools and a statewide support network to help get local programs off the ground. Several TOPSoccer programs are up and running in our state. For more information about TOPSoccer, or to start a TopSoccer Program in your area, contact Scott Craig at scraig@nyswysa.org or 607-427-8563.